CHANIA. The Region of Crete, the Regional Unit of Chania, the Municipality of Platanias, the A. G. Leventis Foundation Scholars Association of Greece in collaboration with the Contemporary Art Museum of Chania - Olivepress present the exhibition"The Muses Project: A Dialogue between Art and Science", which is based on a proposal by Megakles Rogakos for 9 curators and 27 artists. The opening of the exhibition will be held on Saturday, 8 July 2017, at 20:30 at the Contemporary Art Museum of Chania - Olivepress, Dromonero, 33rd Km. Chania - Paleochora, Crete. The exhibition will remain open to the public until 29 October 2017 with free admission. Reflecting their prehistoric heyday, the nine muses have remained connected with their traditional objects. As the arts and sciences have evolved through the centuries, the muses have become emblematic of man’s general ability to study and investigate. Therefore, The Muses Project is inspired by their ancient variety to bring the visual arts into fruitful dialogue with the following nine fields of scientific study, in the order in which these deities appear in the Sarcophagus of the Muses (c. 125) of the Louvre Museum - Clio, muse of history with physics / chemistry; Thalia, muse of comedy with sociology / gender studies; Erato, muse of lyric poetry with computer science; Euterpe, muse of music with geometry / mathematics; Polyhymnia, muse of hymns with biology / medicine; Calliope, muse of epic poetry with economic & political science; Terpsichore, muse of dance and chorus with geography / geology; Urania, muse of astronomy and astrology with astronomy; and Melpomene, muse of tragedy with anthropology / ethnic studies. In the context of the exhibition Dr Rogakos supervises 9 curators and 27 artists. In response to the A. G. Leventis Foundation Scholars Association of Greece’s mission, the exhibition fosters communication among its scholars and strengthens their common scientific, professional and social interests. In line with the rationale of the exhibition, each of the 9 curators assumed the responsibility of illuminating a different science with 3 different artists of his or her choice - Christiana Kazakou physics / chemistry with Yiannis Kranidiotis, Yiannis Melanitis and George Tserionis; Constantinos V. Proimos sociology / gender studies with George Anastasakis, Lamprini Boviatsou and Petros Xenakis; Thanasis Moutsopoulos computer science with Nefeli Dimitriadi, Manthos Santorineos and Costis; Lina Tsikouta geometry / maths with Vasso Gavaisse, Nikos Makarounas and Angelos Skourtis; Alexios Pazacharias biology / medicine with Apostolos Karastergiou, Charalambos Kourkoulis and Paola Palavidi; Louisa Karapidaki economic & political science with Yiannis Adamakis, Elena Papadimitriou and Eleni Tzatzalos; Bia Papadopoulou geography / geology with Ersi Venetsanou, Kostas Vrouvas and Ersi Hatziargyrou; Ioannis N. Archontakis astronomy with Alexandros Dimitriadis, Antonia Papatzanaki and Dimitris Tragas; and George Bourogiannis anthropology / ethnic studies with Andreas Kontonis, Nora Okka and Christina Sgouromyti. 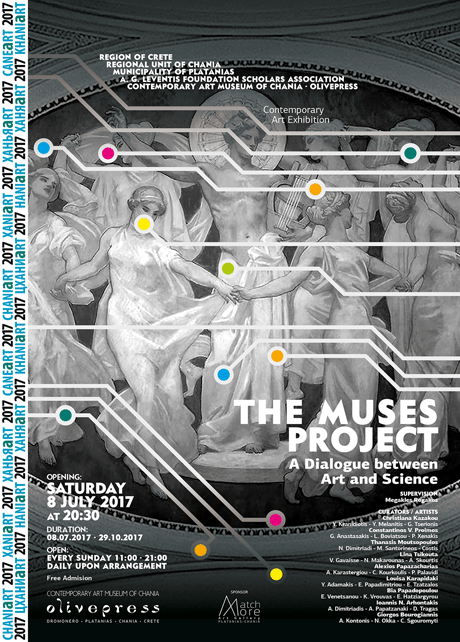 The Muses Project provides an opportunity to explore the relationship of art and science, as seen by contemporary artists. The exhibition celebrates the need for interdisciplinary cooperation and dialogue today.The exhibition catalogue, designed by the Design Bond studio, fully illustrates the 27 works and includes an introduction by the supervisor and comment on each work by the respective curators. 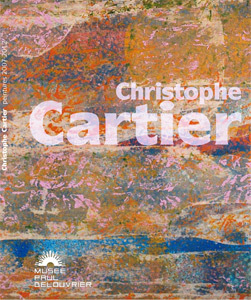 Considering its appeal to a wide readership, the text in the catalogue is in two languages – Greek and English. Venue: Contemporary Art Museum of Chania - Olivepress. Address: Dromonero, 33rd Km. Chania - Paleochora, Crete, GR 73002. Opening: Saturday, 8 July 2017, at 20:30. Exhibition Duration: 8 July through 29 October 2017. Opening Hours: Every Sunday 11:00 - 21:00; daily upon arrangement with Mr Arhontakis at +30 6937 383 500. Communication Officer: Ioannis N. Arhontakis, Artistic Director of Olivepress. 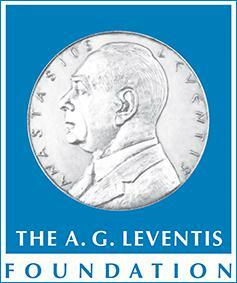 A. G. Leventis Foundation Scholars Association of Greece.